Here’s a pangolin – they are mammals and there are several species across Asia and Africa with slightly different characteristics. Sadly they’re horribly persecuted. What terrible things we humans do. I’m thinking about how I might be able to help with that, but just talking about them helps, right? 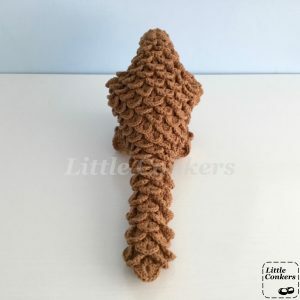 This is a commission for a friend of Mr Conkers – not something I’d usually take an order for, but I saw there was a reliable-looking pattern already out there and decided it could be fun. Fun in the extreme sport, bungee-jumping sort of way. 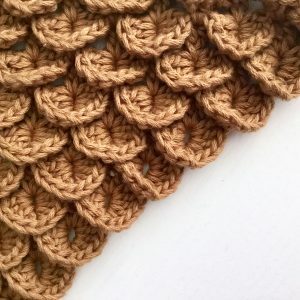 I’ve read enough pattern descriptions and comments on Ravelry and other sites to be able to read between the lines and have confidence in this pattern before buying it. 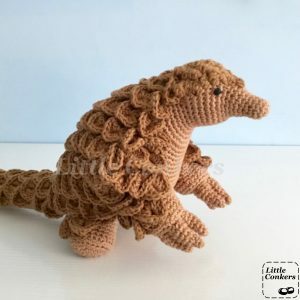 If I had had to do any designing or re-designing myself, this would have immediately become uneconomical, because there are already a lot of hours in a crocheted pangolin. 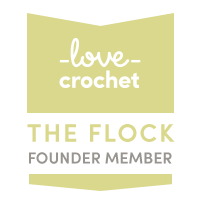 Experienced crocheters will recognise the use of a crocodile stitch here. Despite the recent craze for this stitch, I have yet to have a use for it, and so have never made it before. 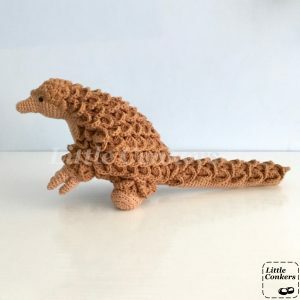 Frankly, I think a making a pangolin is probably the only justifiable reason for using crocodile stitch. I’m looking forward to getting started. The yarn for my pangolin has arrived! 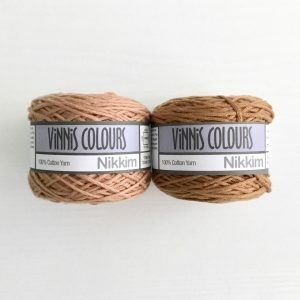 This is one of my favourite yarns that I return to regularly: Vinni’s Colours Nikkim. It’s a hand-dyed cotton with subtle variations in shade that give an organic look to any project. And it comes in a heap of colours – I chose a lovely gingerbread colour ‘Antique’ (579) for the back, and a slightly more pinkish, paler colour ‘Camel’ (504) for the body. This yarn works perfectly for DK amigurumi work with a 3.5mm hook. Vinni’s Colours full range is pretty hard to find in the UK – I import a bulk order from South Africa once or twice a year. So far I’m right about Pernille Heelsberg’s pattern – it’s excellent: clear and unfussy and I haven’t experienced any need or desire to change anything so far. That’s extremely rare for me. I’m pretty sure the hard part is going to be the making up at the end though. 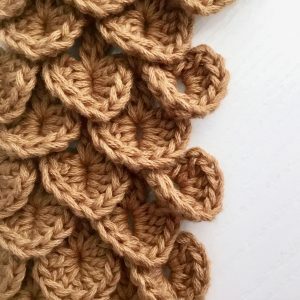 I’ve really enjoyed making the crocodile stitch skin. 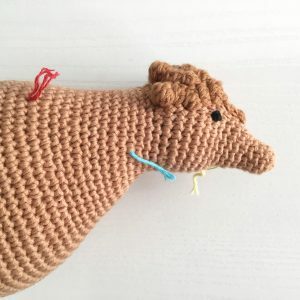 It’s a relaxing piece to work because there’s a lot of regular repetition and not much counting, and it’s very easy to keep track of where you are on your work – unusual in an amigurumi piece! 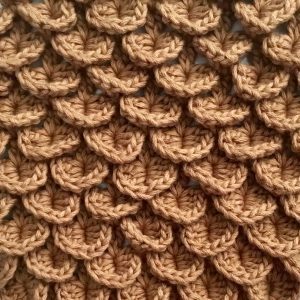 It’s worth remembering that crocodile stitch is really a class of stitches, rather than a single stitch. 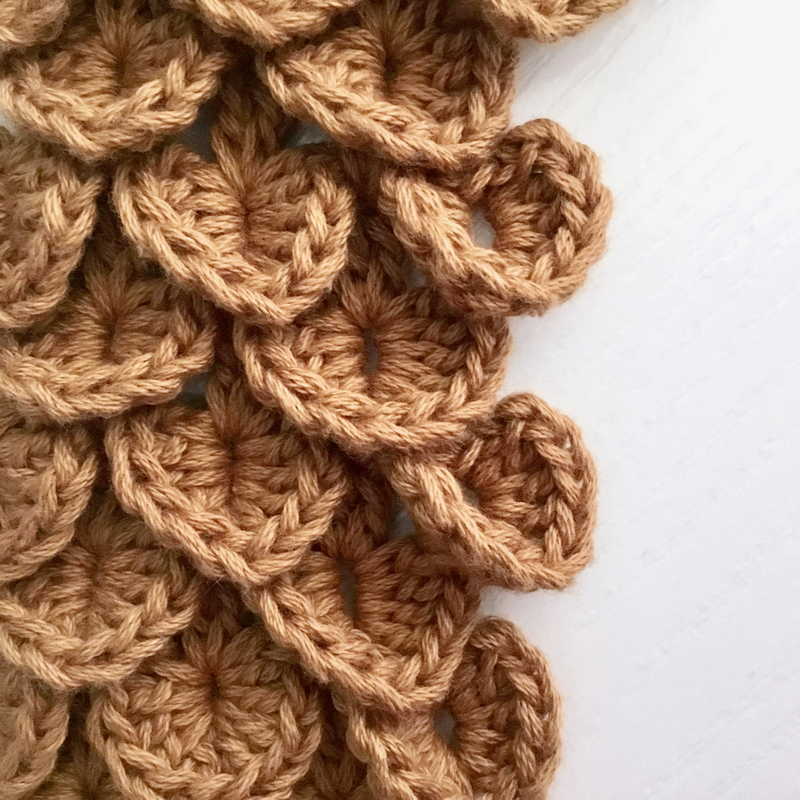 All the other crocodile stitches tutorials I’ve looked at (such as this Red Heart crocodile stitch tutorial, or this crocodile stitch tutorial by Moogly) work the scales from right to left with the right-side facing, as you’d expect. Then the return row of foundation ‘ladder’ stitches are worked from right to left with the wrong side facing. Interestingly, in this pattern, the crocodile stitch scales are worked from left to right with the right-side facing, and then the foundation ‘ladder’ stitches from right to left – so the whole piece is worked with right-side facing. This is all explained perfectly clearly in the pattern, but might take a moment to get your head around if you are used to turning between rows. 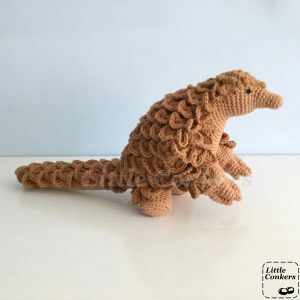 Ravely user sweaterpimp provided helpful notes on her pangolin, so like her I have decided to lengthen the tail of my pangolin. I added two extra rows of scales in the thin part, and two extra rows at the base of the body area – so not as long as sweaterpimp’s but longer than the original. 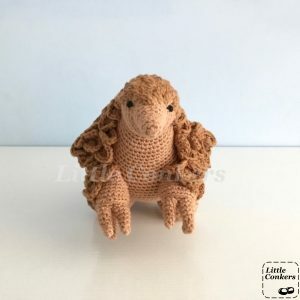 Another Ravelry user, dianani, noted that the design would look better with the head bobbles in the same colour as the back scales, so I’m going to do that too. I’ve got to say I’m having an absolute hoot with this guy! The pattern for the body is working great, and I’ve added the extra rows to elongate the tail a bit. I’ve been out in the garden early this morning looking for a couple of smooth pebbles to weight her feet with – I need to do a bit of experimenting to see how that works. Inevitably I’ve been thinking about the plight of the pangolin which is so threatened in both Africa and Asia by poaching. 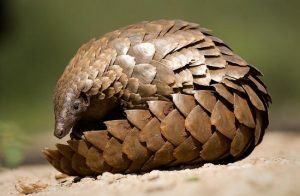 If you’d like to know more about the pangolin and efforts to protect it, ZSL’s Pangolin Conservation page is a good place to start. 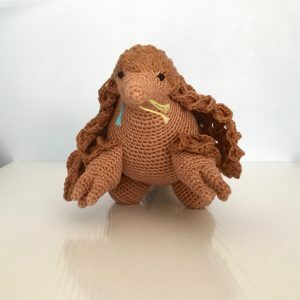 I’ve spent the weekend working on the leg positioning and weighting to get my pangolin to stand on her rear legs, which she now just about does. Part of the trick was to stuff the tail less firmly than usual around where it joins the body, to allow it to fold. In the pattern, the tail comes straight out of the body meaning if you stuff it firmly it acts as a spring to push the body forward. I’ve also added smooth pebbles to the back legs and base of the tail. 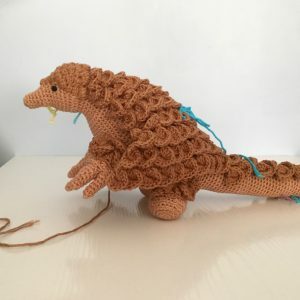 I’ve tried to make the front legs and claws less splayed than in the original, something more akin to the “hand-wringing” posture that is so endearing in pangolins. It’s better but not great, but for reasons explained previously I’m not altering the pattern (which I still think is excellent). By contrast, I spent a couple of hours this weekend re-writing a knitting pattern for my sister. The pattern was a classic of all the things I hate about poorly-written patterns. Rows not numbered; the fact the four rows forming the repeating pattern were numbered set-up, 1st, 2nd and 3rd in the text and 1, 2, 3 and 4 on the diagram; and the awful “now continue in the same pattern for 25cm, whilst and the same time decreasing 4 sts every other row at the armhole edge, and placing buttonholes every 6 cm” type of instruction. Yes the knitting skills involved could be described as ‘intermediate’ but the pattern itself required all my advanced experience to interpret it. What I object to is that it is lazy on the part of the pattern-writer. It is not ‘clever’ or ‘simpler’ to shorten pattern down to the minimum in this way. Yes, all the data you need is there, there is nothing incorrect in the pattern, but why not make it as easy as possible for the reader to follow it? That means writing out if not each row then most rows with all the stitch numbers spelt out, even if this is a lot of repetition – it’s only cutting and pasting for the designer and so much easier for the reader. Anyway, I digress. On the pangolin it remains for me to sew on the back scales which she is currently wearing like a super-hero cape. There is some jiggery-pokery to this which I haven’t quite got straight in my head, but we’re getting there! I’m so pleased with how she has turned out and am hoping the recipient will be just as pleased. I can totally recommend this pattern. Other than lengthening the tail, which I think is definitely worth doing, I made no changes. I have angled the front legs and claws inwards as much as possible, but only by how I have sewn them on, not by changing the pattern. I think you can see the difference between the photo below and the photos from 21st May above. The base of the tail and rear legs are weighted with pebbles, so she stands on her rear legs. 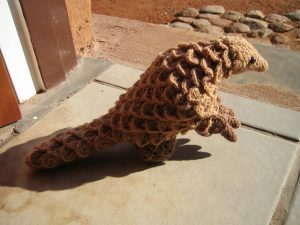 Click here to see my crochet pangolin project on Ravelry.